An Australian meets an ABC! "Hey listen, mate! Do you get Panthers in the UK?" My reply was non-commital, but I enquired why he asked such an outre question! He responded with the following account! The previous weekend, Malc had been driving along the A47 towards Kings Lynn from Norwich. As he neared the familiar twin wind turbines at Swaffham, he was forced to brake abruptly to avoid running into the rear of the car in front: this had swerved and slowed unexpectedly for no obvious reason. To Malc's astonishment, an enormous black cat crossed the road in front of the stationary vehicles, before loping up the embankment and disppearing. Malc, his wife and two children witnessed the whole amazing occurence from a range of around thirty yards! His description was the classic: a heavily-built black cat with a long, drooping, muscular tail, somewhat larger than an Alsatian dog! Linda and I have our closest encounter! 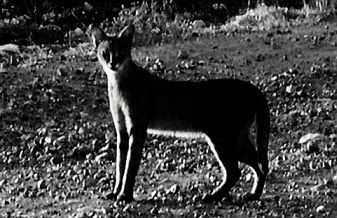 A slim, greyish cat about a metre long was loping along the verge! The triangular face and large ears left no room for doubt: the unexpected feline was a Jungle Cat! Needless to say, Linda and I were really excited by our sighting, and discussed it non-stop all the way back to the M25! Larter, research on the internet revealed that a female Jungle Cat had been run over at the same spot two years previously! Could this be evidence of a breeding population of these beautiful felines?